Homemade soft and chewy peanut butter cookies decorated with white sugar for a festive touch, perfect for Christmas. No chilling required, no butter needed, and ready in less than 20 minutes. 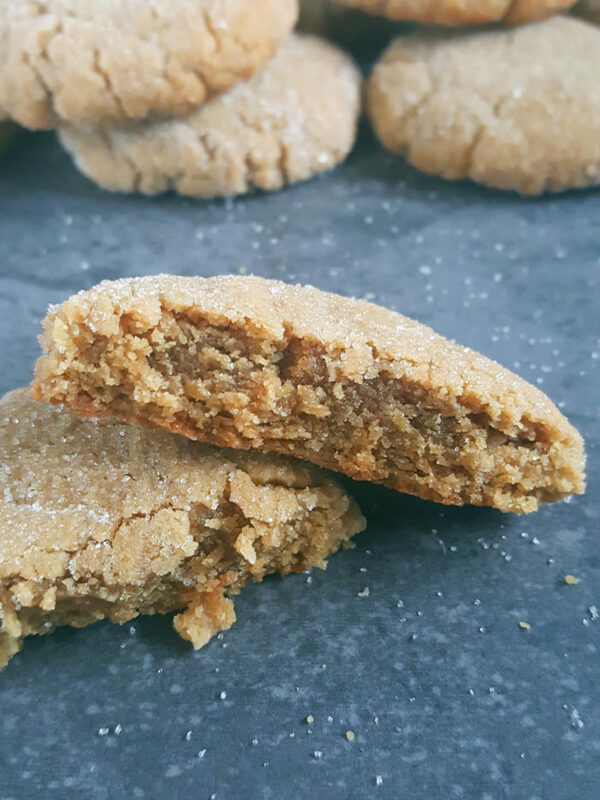 The best easy dairy-free peanut butter cookie recipe you’ll ever make! 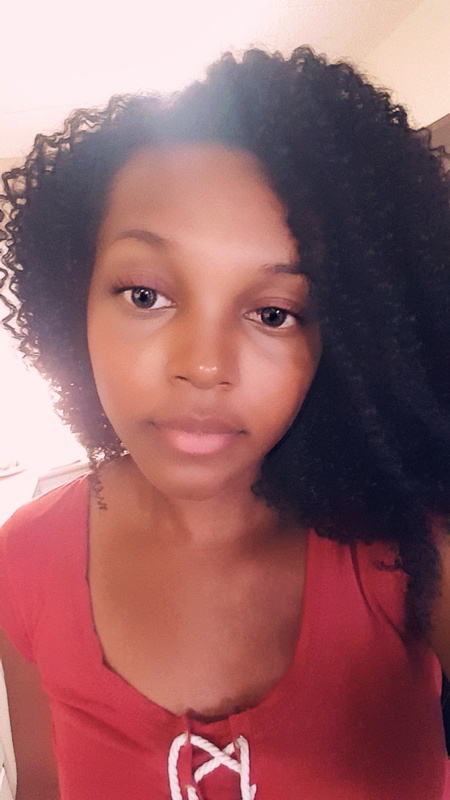 I’m not a big fan of peanut butter on its own however I love it in cookies, especially those with chocolate chips, and sometimes I have random cravings for peanut butter cookies. I crave them so bad that I need them ASAP. I don’t want to spend forever making them and I don’t want to spend forever waiting for them to bake. That’s where this recipe comes in. 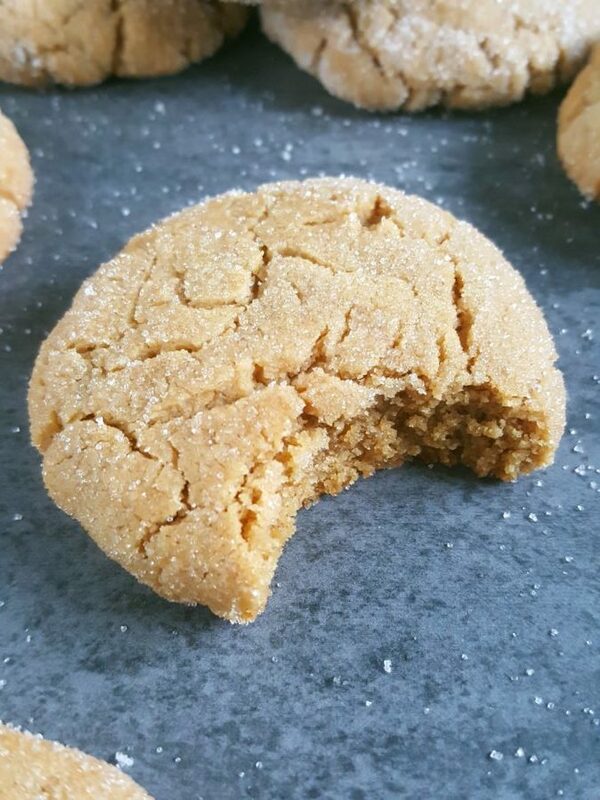 This one bowl peanut butter cookie recipe is so easy. It’s made without a mixer, requires only a few simple ingredients and comes together in minutes. The dough requires no chilling (no refrigeration), there’s only 10 minutes of prep, and the cookies take only 8 minutes to bake which is less than 20 minutes in total! So it’s not only an easy recipe, but a quick and convenient one too. I’m proud to say that this recipe is an experimental success! The peanut butter replaces the butter completely. Yay! So this cookie dough contains no butter whatsoever. Instead, the fat from the peanut butter is used to keep these cookies soft and moist. They still taste like they do have butter in them though, which is pretty amazing. I wasn’t sure if it was going to work out but it did (I love when my gut feeling is right). Because of this, there is more peanut butter flavor in this recipe. It’s not drowned out or “spread thin” between a ton of cookies. So if you like a stronger peanut flavor you’ll definitely love these. Not only are these cookies chewy, which are my favorite kind of cookies, but they are also soft. Yes, the best of both worlds. 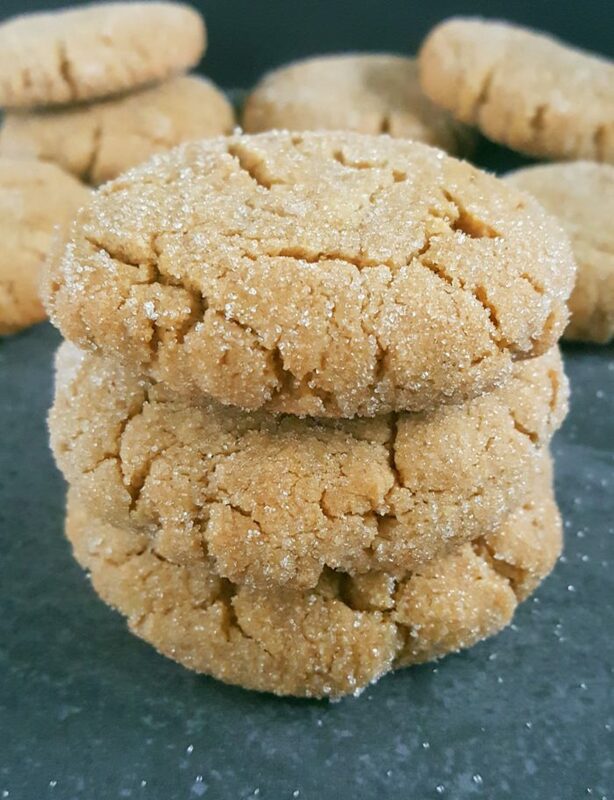 You’ll notice that these peanut butter cookies have got a little sparkle to them because it’s Christmas time! I couldn’t resist because it’s so festive and it makes them look so pretty and it’s honestly just a really nice finishing touch. These aren’t usually considered Christmas cookies however I’m positive that they’d be a delicious surprise on any Christmas cookie platter. 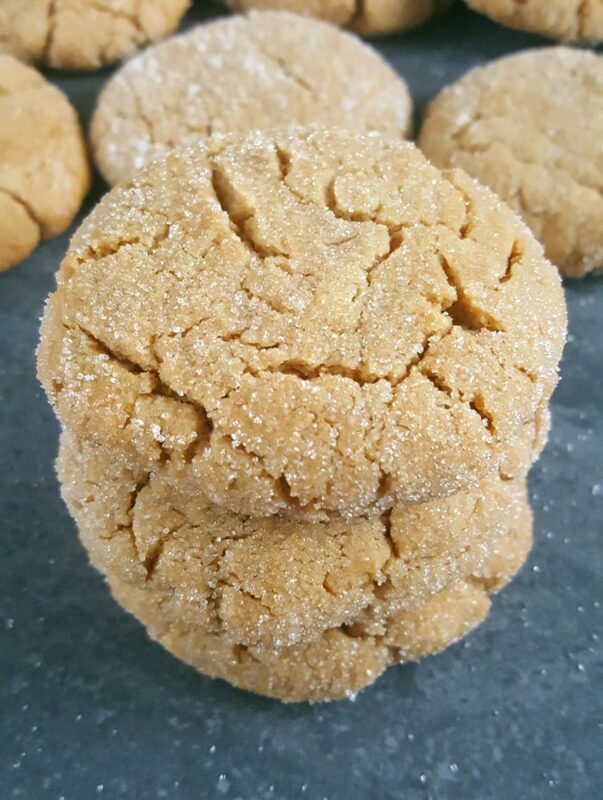 What makes Peanut Butter Cookies Soft & Chewy? Under baking the cookies make them and keep them soft. Removing the cookies from the oven while the edges are just set and the center is soft to the touch and slightly under baked will yield cookies with a soft texture. 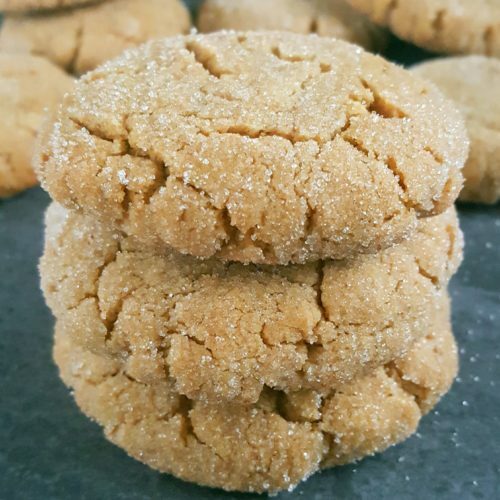 Also, because these cookies are made mostly with brown sugar they are so moist and soft in the center, chewy around the edges, and the flavor is just absolutely delicious. They have crinkle-crackle tops and they smell amazing! The white sugar creates a slight crispness too which I love. 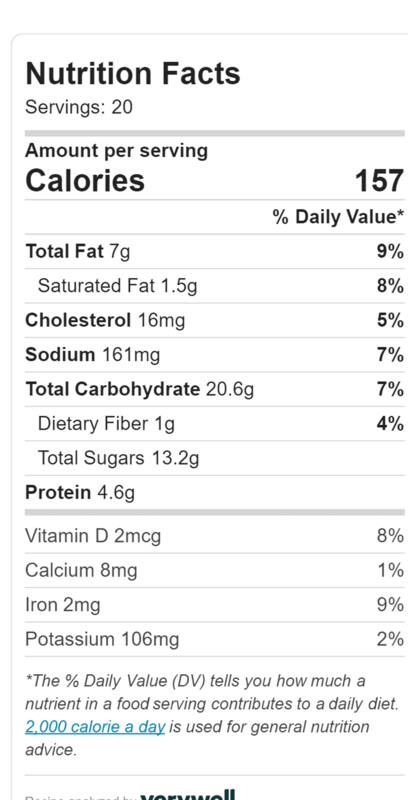 What are peanut butter cookies made of? Nothing crazy; just basic ingredients that are staples in most households. Substituting crunchy peanut butter for creamy: You can definitely do this! The peanut chunks will not negatively affect the consistency of the dough. Preheat the oven to 350°F. Prep the baking sheet and set aside. In a large bowl combine the peanut butter and both sugars. Then slowly incorporate the eggs and vanilla extract. Add the flour, baking soda, and salt. Slowly mix until the dough is formed and streaks of flour are no longer visible. Place 3 tablespoons of white sugar in a small bowl. Take a 2-tablespoon sized ball of dough, flatten and shape into a cookie about 1/2 an inch thick. Press both sides of the dough into the white sugar then place on the baking sheet. Continue until all dough is used (or just enough for 1 batch). Space them evenly apart. Bake for 8 – 9 minutes. Cool on the baking sheet for 10 minutes then remove. As you’re incorporating the dry ingredients into the wet ingredients you’ll notice that the dough is a little crumbly but don’t worry, just keep mixing until the streaks of flour are no longer visible. It comes together and holds its shape perfectly when you work it with your hands. The cookie dough is slightly oily from the peanut butter but it’s the perfect thickness and doesn’t spread much so there’s no chilling/refrigeration needed. Just like with most peanut butter cookie recipes, you’ll need to flatten the dough to about 1/2 an inch thick and for this particular recipe you also need to shape it into cookies. With this method the cookies turn out perfectly soft & chewy (and it makes them look more Christmas-appropriate). After shaping, press both sides of the dough into the white sugar then place it on the baking sheet. Alternatively, you can go the traditional route and use a fork to press a crisscross pattern into the top of each ball. Because this cookie dough is a bit oily I find that it’s better to press the dough into the sugar after flattening/shaping than to roll it in the sugar beforehand. Store them in an airtight container or food-safe resealable bag, removing as much air as possible. Additionally, you can add a half a slice of bread to the container which makes the cookies absorb the moisture of the bread to help keep them fresher and softer longer. White bread is best for this. These cookies will keep at room temperature for 4 – 5 days. After cooling completely, these cookies can be frozen as is. You don’t need to freeze them in a layer beforehand because they don’t stick together. Just place them in a freezer-safe resealable bag, remove as much air as possible, close and freeze. You’ll be so surprised at how soft these cookies turn out despite being dairy-free. This is the main reason why I never buy peanut butter cookies from stores, or cafés anymore because I am always disappointed. Not a few times, not sometimes, always. So I don’t bother anymore. 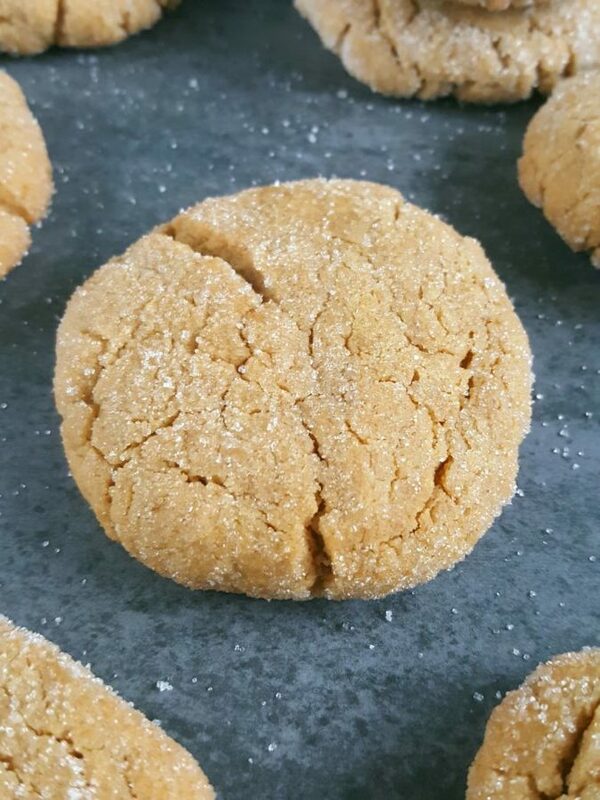 I’ve realized that the best peanut butter cookies are homemade and this quick and easy recipe is sure to become one of your favorites! Preheat the oven to 350°F. Line a baking sheet with parchment paper or a nonstick baking mat and set aside. Take a 2-tablespoon sized ball of dough, flatten and shape into a cookie about 1/2 an inch thick. Press both sides of the dough into the white sugar then place onto the baking sheet. Continue this process with the remaining dough. Make sure that the cookies are spaced evenly apart. Bake for 8 - 9 minutes until the edges are set and the centers are soft and slightly under baked. Allow cookies to cool and firm up on the baking sheet for 10 minutes then remove.